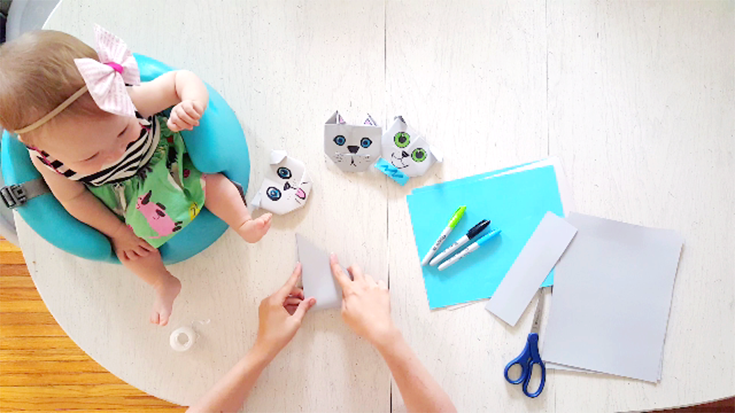 Make Your Own Puppy Dog Pals Puppet & more FriYAY FUN with Disney Junior! Today's discussion is sponsored by Disney Junior; regardless all opinions expressed below are my own. My baby girl is my side kick, my shadow, my mini me... She seems to love the same things I love and well, that's just heartwarming. While she shares my sassy side, I love already knowing that we also have common interests. 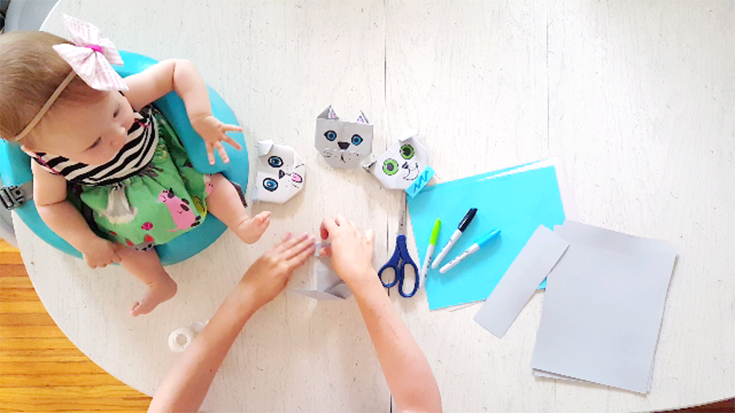 From being a total foodie (who loves to occasionally watch cooking shows) to being a little fashionista who loves the camera, she's pretty much my twin - in a tiny, adorable form! 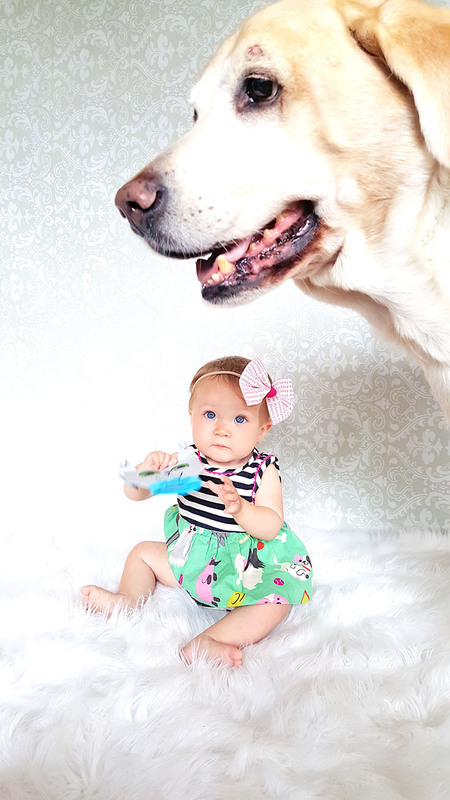 Here's the thing, if my daughter and I have one thing absolutely identical about us, it's our love of animals. She is absolutely gaga over birds and staring at dogs is probably her top favorite activity. I have a feeling she and I will likely surprise her daddy with a little puppy pal in the years to come, but for right now - we are savoring the time with the dog we already have and looking forward to adding to our family, someday! With that said, we have a not-so-little doggy visitor this week and she is loving the extra company! Her and I are always admiring other doggies, whether it's at the park, on TV, or dog sitting - we love the company of puppies! So after catching an episode of Puppy Dog Pals a few weeks ago on Disney Junior, we are BIG TIME Bingo, Rolly, Hissy, & Bob fans! And if I'm being frank, I suppose I can be a little bit of a "Bob" at times with my crazy schemes and ideas. 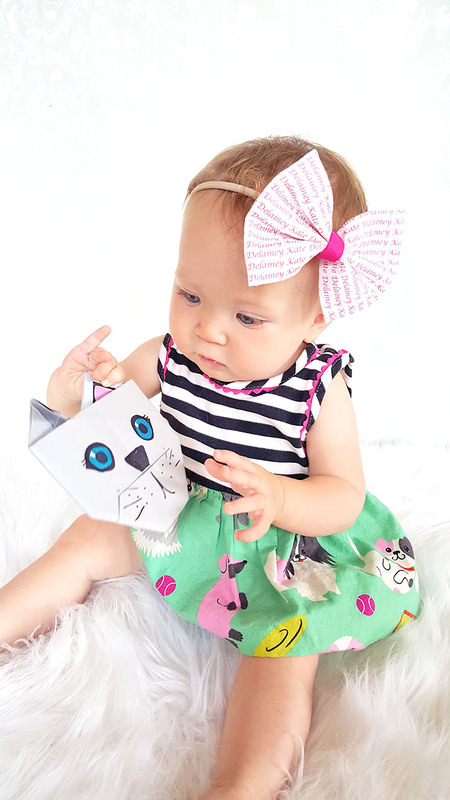 Luckily, my little gal pal loves me as much as those puppy dog pals love their owner, so she just goes along with my crazy shenanigans just like Bingo & Rolly do with Bob! While we try to limit the amount of TV Delainey watches, I'm pretty sure we can count Puppy Dog Pals as "her show" now... she smiles and laughs when her favorite Puppy Dog Pals are playing and when they get into trouble, you can see her trying to help figure it out! It's just precious... and on that note, I'm fairly certain that D daydreams about the adventures she can get into with our dog. From plotting future mischievous deeds her and Pow can do, to dreaming of riding the visiting bear of a lab, Barkley, around the room - I can see the wonder in her eyes each time she looks at dogs. 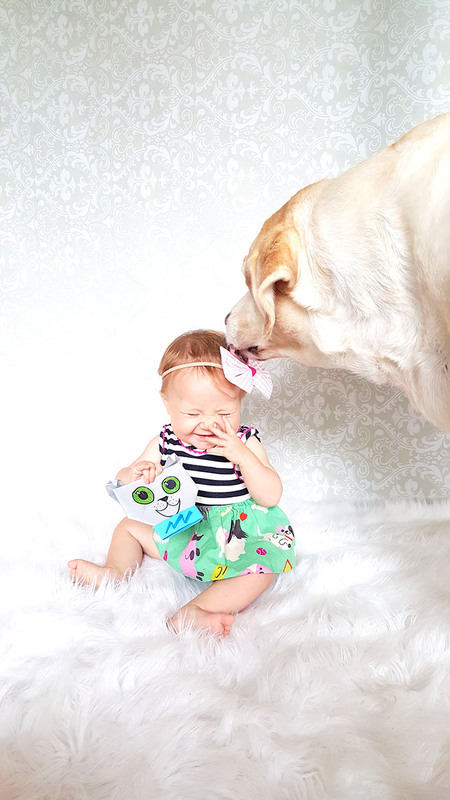 Doggies really are her best friends and it's sad but this is the real world and our dog, the dog we are dog sitting, and even Puppy Dog Pals can't come with us all the time. 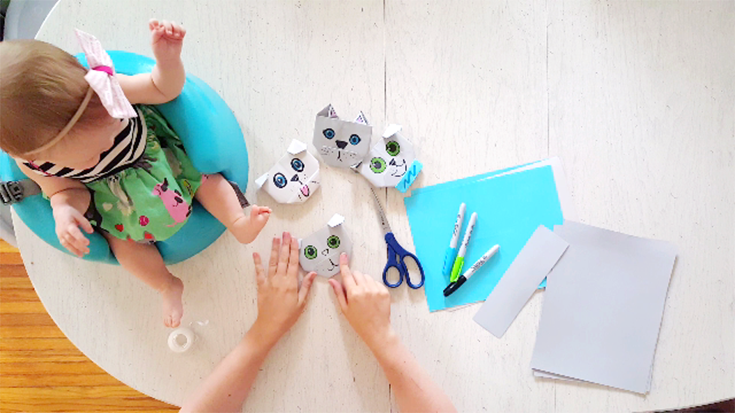 So I decided to get crafty with my sidekick and make us some adorable little canine companions that we can take along with us everywhere from the library to the doctor's office! 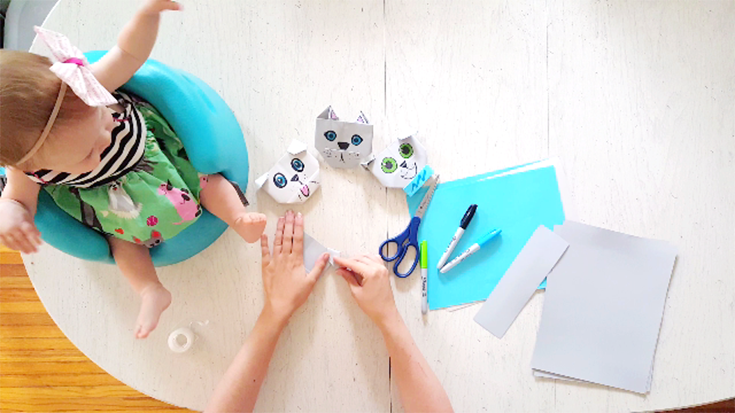 It's super easy to make a little puppy puppet and the best part is you can customize them however you want, so your puppy pal will be your very own design and your best friend! 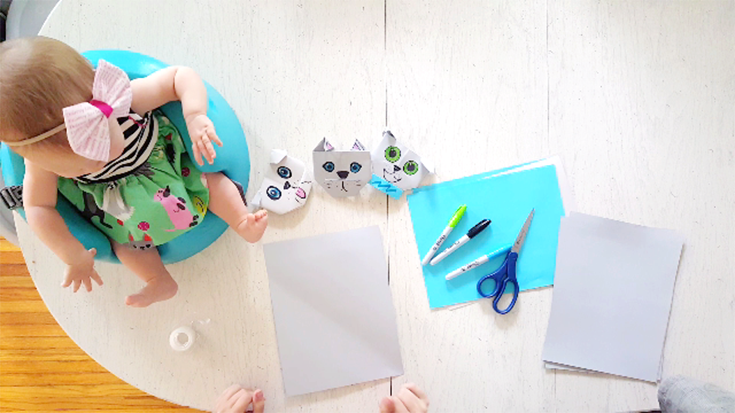 While it may just be a piece of paper - I know Delainey loves our new little companions and while it isn't the same as taking our pups on adventures, I think she's pretty happy with her mama made paper pups. 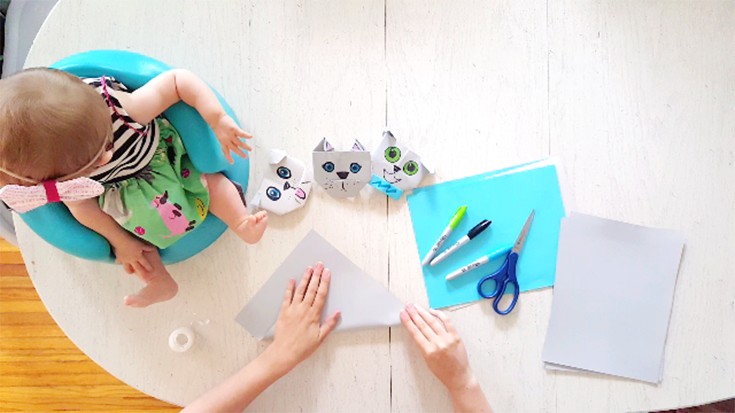 To start you'll want to fold your paper into a perfectly even square by bending one corner into the paper and making a giant triangle, cutting and removing any excess. Next, gently fold the triangle into a smaller triangle, creating a mid-line for you to follow. Unfold and lay the "giant triangle" on the table. After that fold the lower (open mouth) point over onto itself, leaving about a 1cm gap at the top. Once you've completed that step, unfold and separate, laying the two pieces on top of each other and folding the top piece down slightly, creating what will be the nose area. 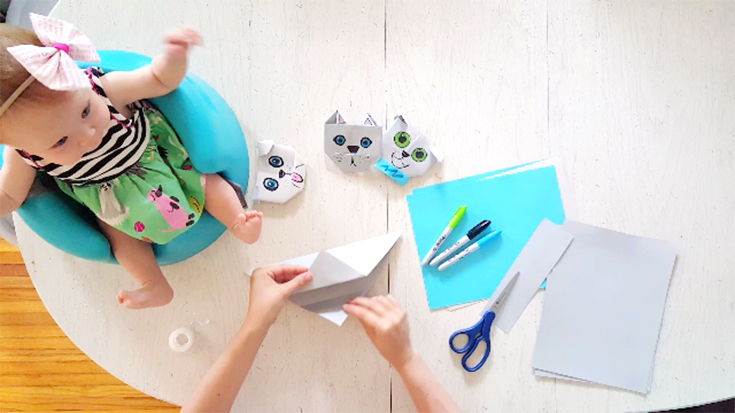 Following that step, flip the piece of paper over and fold the two edges in, creating tiny triangles down at the bottom and a "winged" looking piece of paper. 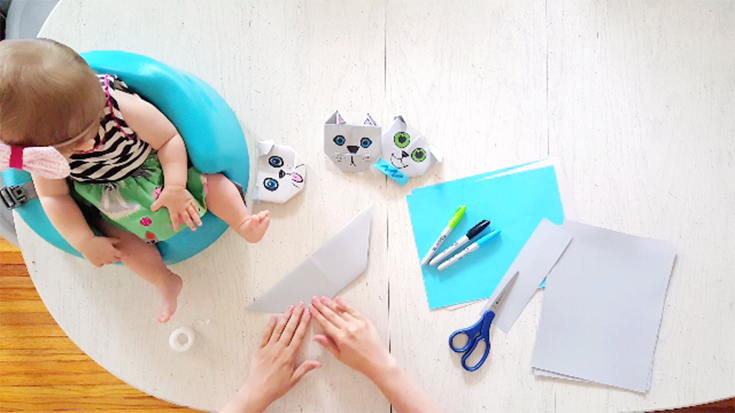 Again, fold those two piece into themselves, creating what will resemble a fox like shape. Finally, fold the fox ears one more time to make them either more puppy or kitty like, leaving the ears pointy for a kitty like Hissy or folding the ears over and making them less pointy like Bingo and Rolly. The last but most important step, decorate your pup! 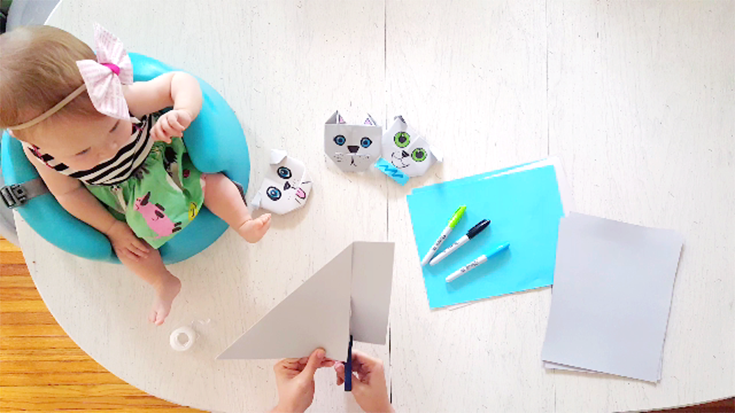 Add a nose, eyes, spots, and more with markers! Make a collar out of paper, maybe even a leash or like Bob, you could even try and make an "invention"?! Use your imagination and have fun! 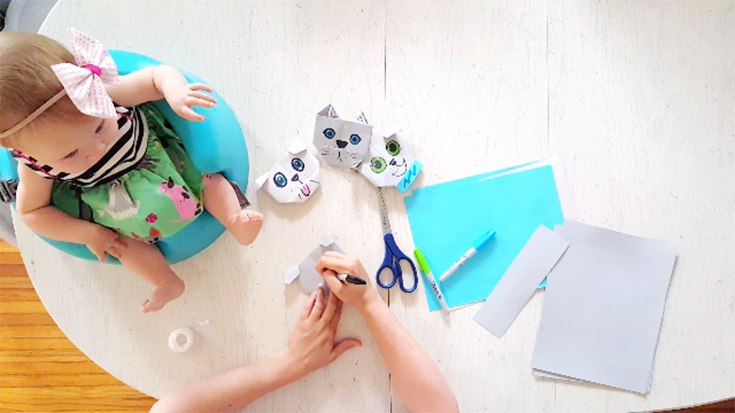 And that's it, you have created the perfect puppy puppet, with your own two hands! 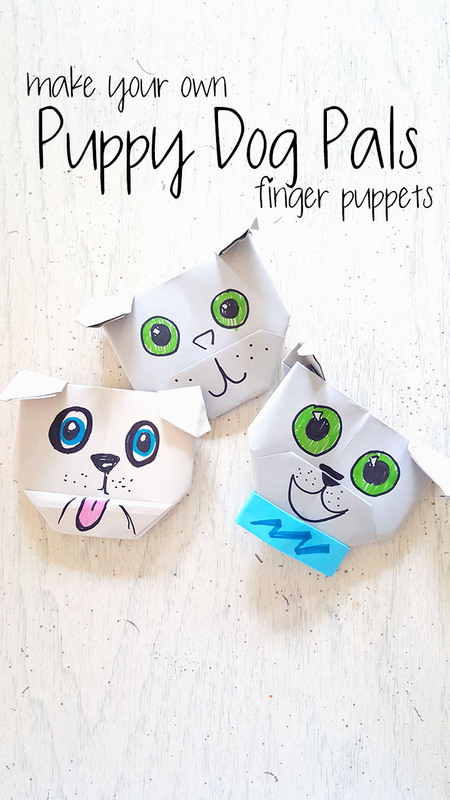 If that was too much to try and follow via photos and text, I decided it'd be easiest to show you how to fold your puppy puppet! 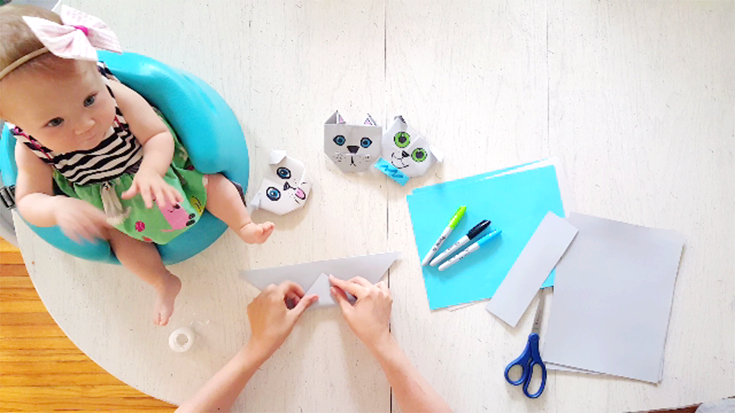 Check out the video below and give this super easy origami puppy fold a try! 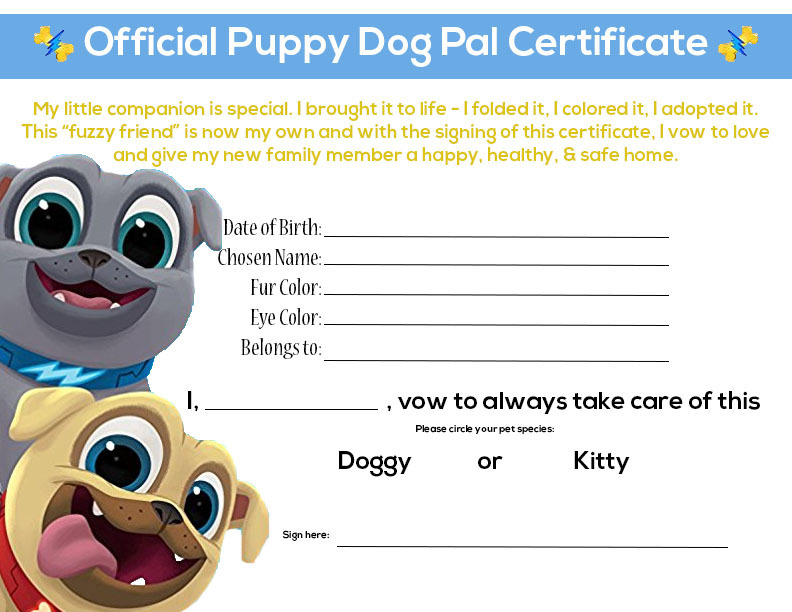 Once your puppy is completed, I made a super special Puppy Pal Certificate you can personalize and print, making each and every Puppy you create a real member of your pack! After all that fun, I'm sure a break is on order! 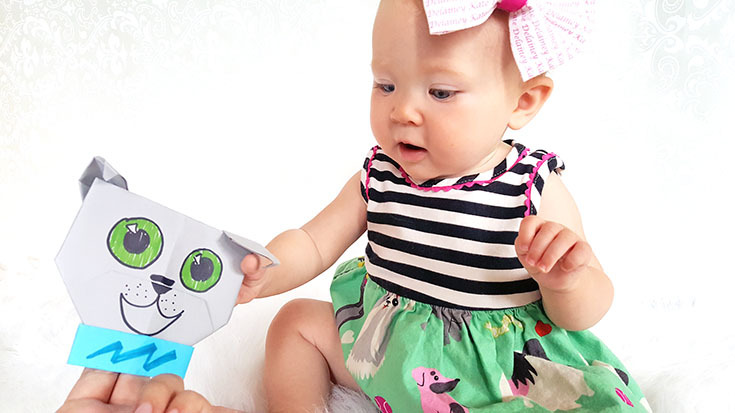 Want to catch the next episode of Puppy Dog Pals? Tune into Disney Channel on FriYAY morning for new episodes... and if you miss those, check out our new favorite show on Disney Junior!